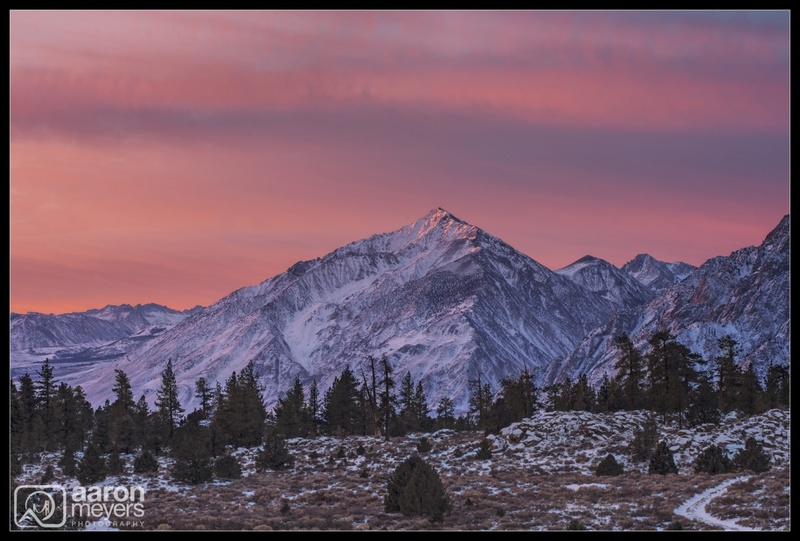 One scene that Willie and I knew we wanted to photograph in the Eastern Sierras was sunrise at Mt. Tom. One of the most iconic and largest peaks in the Owens Valley region, there are many ways to photograph Mt. Tom but we felt this angle showed off its best side. The combination of trees, meadow, and mountains, along with the line running up Mt. Tom, make for a spectacular scene. It was freezing when we woke up. Let me correct myself … it was well below freezing. It was barely over 5F when we set out and on that day we didnt see above freezing temperatures for many hours. This morning was also cloudy and as we drove to our spot we started to get really excited there was going to be a ton of color in the sky. Willie and Alan had scouted this location a month or two previously but Willies GPS unit somehow deleted the coordinates. Alans attempt to remind us of the spot resulted in the wrong location. I think we did 4 U-Turns on CA-395 before finally getting to the spot we wanted The light to our east was going crazy and as soon as I put the car in Park we were grabbing our gear and running through the snow to setup our tripods.